They have known each other since 1973 and since then have played together in numerous groups and ad-hoc combination, there have been countless recordings and still they have never made a duo record together. 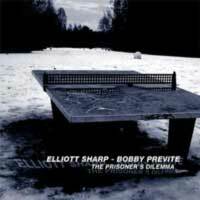 We're taking about Elliott Sharp-guitarist, multi-instrumentalist and composer-and Bobby Previte-drummer and percussionist. That is reason why The Prisoner's Dilemma sounds like a conversation between old friends about plans for the future and stories from yesterday, but at the same time sound new and unheard-of. It is a conversation that has never been carried out in public before in this breadth and with this love of details. Of course, neither Previte nor Sharp care about trends or hip attitudes, they know each other too well to do that. And moreover, they draw their music from an extremely rich history. Both are influential figures of the New York Down Town scene-from the very beginning. They haven't just played with the greats (John Zorn, Bill Laswell ...), but they themselves count among these musicians, without exception. In addition they have proven themselves as band leaders, label makers and composers, they helped make The Knitting Factory what it now is, and now, where they have passed their 50th year in the best health, they have enough energy to take on new large project. The Prisoner's Dilemma is such a project. In the foreground is the groove. No, in the foreground is the layering and condensation of rhythms and sounds. Or does one have to speak of sublime flow that they celebrate and that reminds one of Can or on the abstract projects of the SST family? The Prisoner's Dilemma cannot simply be typecast; too much happens, too much rocks at the same time. Never does the music, however, at any point in time, take on an arbitrary character. Seldom has one heard a grooving improvising duo play so resolutely. They don't make any false compromises. If the consequence out of their interaction means "noise," then they take it up and the music is exactly that: an outbreak of energy, a first-class power play. Bobby Previte and Elliott Sharp can also let the things run, laid back, they can allow themselves to cite musical-historical references without seeming so obvious or eclectic. As said, both have a lot to tell. The Prisoner's Dilemma presents the highlights of their conversation.